We accept applicants that we believe are best qualified to participate in and profit from a program of study here. A key consideration is past performance, taking into account scholastic achievement and standardized test scores. 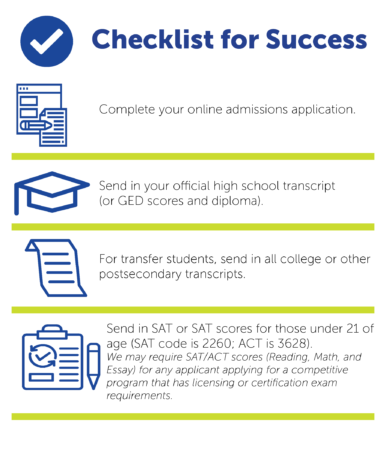 Once accepted, students may qualify for earned credit and advanced standing, based on the results of Advanced Placement Examinations. Specific programs of study may have additional requirements, and transfer credits may be accepted from previous studies. Be sure to check the requirements in your area of interest. The application deadline for housing is July 1. TIP: Apply sooner than later! With our rolling admissions policy, we process applications throughout the year in the order received. This means more certainty in your future, as you’ll receive an admissions decision within two weeks of completing all procedures. You’ll also be further along in the enrollment process, which improves your chances for scholarships and financial aid – and for getting your first selections for class times and professors.